If you are searching for a fun, part-time job with great benefits, we have a hidden gem for you! 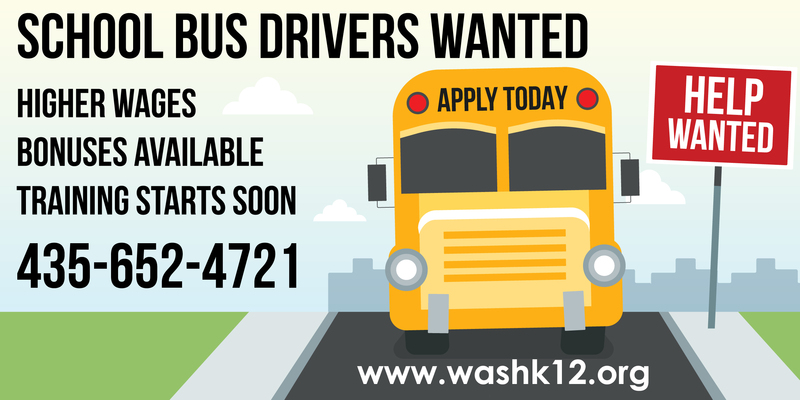 Any WCSD employee that refers gets $100 bonus. We know you share our concern for the safety of the children that ride our buses. The Washington County School District has an excellent safety record with highly skilled bus drivers that are State Certified. With another 56 hours of training by State Certified instructors as well as ongoing driver monitoring and retraining, your child's school bus is much safer than your personal vehicle on the road. According to the National Academy of Sciences, the US. Department of Transportation and other authorities agree that school buses are the safest form of transportation for getting children to and from school. We are working hard to ensure a bully free and safe environment for students on the bus. We want to enlist your help as a parent. Encourage your child to communicate with their bus driver, teacher or administrator if they don't feel safe on the school bus. We ask that you impress upon your child the importance of following bus safety rules and to obey the bus driver at all times. Staying in their seat at all times is a must for a safe ride to and from school. Another issue we must all face is the rising cost of fuel. We at transportation are committed to staying focused on balancing the needs of the students and at the same time are actively engaged in minimizing or limiting the related transportation expenses. Please remember that we are... Working with you because we care. Dear Parent/Guardian: We are pleased to be transporting your child to and from school this year. We are very proud of the safety record of our school buses and the professionalism of our transportation team. Provide your child with a backpack or bookbag. Loose papers or other items are dangerous as children get off the bus. Check your child’s clothing for the presence of long drawstrings or other dangling items. Long drawstrings or other dangling items could get snagged in the bus door as the child gets off the bus, and should be removed from clothing. Make sure your child arrives at the designated bus stop five minutes early each day. Children who are late for the bus may panic and chase it, or run into the road. Insist that your child wait for the bus safely in an orderly fashion, back from the roadway. Behavior problems at the bus stop can create hazardous conditions for children. When the bus arrives, your child should wait for the bus driver’s signal before boarding. Children should board in single file. Teach your child to sit quietly on the ride to and from school. Behavior problems could distract the bus driver and result in an accident. It is important that our drivers are able to concentrate on driving the route safely. If anything makes your child feel unsafe at the bus stop or on the bus ride, please contact us at the transportation department, rather than trying to discuss it at the bus stop. We are deeply committed to the safety of your child as well as all our community’s children. Thank you! Across the U.S., children are being injured or killed when their clothing is caught in the bus handrail, door, or other equipment, and they are dragged by the bus.